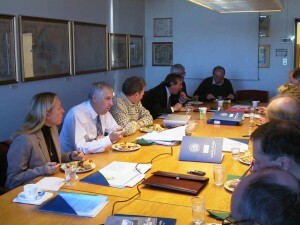 The first Board meeting of the Institute of International Affairs and Centre for Small States Studies at the University of Iceland, 19 October 2002. 27 people took part in a working meeting at the University of Iceland, 17-20 October, in order to establish the Centre for Small State Studies. Participants discussed ideas concerning the role and operation of the Centre. A number of working groups was established e.g. to publish a book on established theories on small states, to launch a working paper series on small states, to hold an opening session in July 2003 and to hold an academic conference in September 2004. A webpage for the Centre will open soon. This entry was posted in Institute of International Affairs and Centre for Small State Studies. Bookmark the permalink.